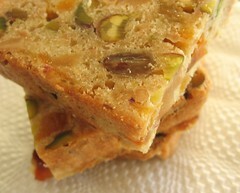 Golden New-Fashioned Dried Fruitcake with Cashews, Pistachios and Bourbon - Do You Know The Muffin Man? Notes: A lengthy list of ingredients, and a long baking time, but this fruitcake is worth it. Wonderful rich base flavour from butter, ground cashews and bourbon. The various dried fruits contribute both sweet and tart flavours, without the excess from traditional candied fruit. It's packed full of textures, flavours and ingredients, exactly the combination a fruitcake should have. I increased the bourbon by 2 tablespoons, and ground some of the pistachios (and less of the cashews). I'm making the 1.25 kg 9"×5" loaves available for purchase this year. If you live nearby, contact me for samples, orders, and pricing.